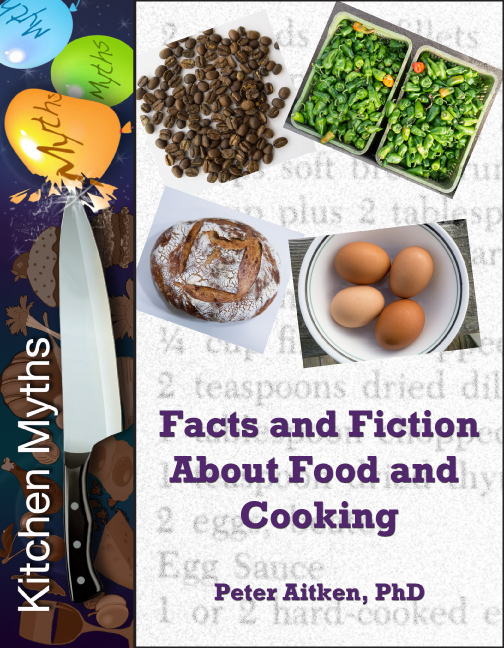 Now available for Kindle, iPad, Nook, and other devices: the book version of the Kitchen Myths blog. Kitchen Myths – What’s this Blog all About? Many widely accepted “truths” about food and cooking are just plain false—in other words, they are kitchen myths. Learn the straight skinny here! See the About page for more information about me, your friendly myth-buster, and this blog. It seems to be a common belief that once frozen meat has been thawed, freezing it again is unsafe. This is false. There may be some loss of quality and texture, but the refrozen meat will be perfectly safe (assuming you always follow the usual precautions regarding meat). Nope, it’s just marketing. The small, torpedo-shaped carrots you see labeled as baby carrots are actually mature carrots that had some physical deformity, such as being crooked , and therefore could not be sold whole. Some marketing genius realized that these carrots could be mechanically trimmed down the the bad parts removed, with the remaining good part labeled “baby.” Now there’s nothing at all wrong with these carrots, except perhaps the inflated price–I use them all the time. Just be aware that you are not actually getting baby carrots. It’s true that acidic foods can react with iron, but who uses a cast iron pan that has not been seasoned? The coating of seasoning protects the iron from the acid, so you are OK. If you have an unseasoned pan, than that’s a different matter, but even brand-new pans are almost always pre-seasoned. In many markets you will find bags of “Carolina” rice. Don’t be fooled into thinking this is “Carolina Gold” rice. History tells us that Carolina Gold rice came to South Carolina in 1685 when a ship traveling from Madagascar stopped in Charleston and paid for repairs with a bag of rice seeds. These seeds were the foundation of South Carolina’s 200 year history as the leading rice producer in the US. This rice’s taste and texture set it apart from other rice and it was in great demand. For various reasons, cultivation died out around the end of the 19th century. Today, a few specialty growers keep it going and sell to the public (yes, it is expensive!). “Carolina” rice, on the other hand, is nothing more than a trademarked brand name. The rice is not the same strain as Carolina Gold and it can be grown anywhere – Texas, Arkansas, etc. It is perfectly fine rice but is not Carolina Gold and does not have the special taste and texture. They are, to tell the truth, quite similar. But not the same. In most cases it does not make any practical difference. Navy beans are smaller yet take longer to cook than the great northern bean. They feature in famous recipes such as Boston baked beans and Senate bean soup. But great northern beans taste pretty much the same. So don’t worry about which kind you have as long as you are aware of the cooking time difference. We have already dispelled the myth that gluten is somehow bad for your health–aside from the very small percentage of people with celiac disease this is simply not true (see here). There’s another gluten-related myth, however: that gluten-free foods are somehow more healthful than their “normal” gluten-containing counterparts. In fact, over 30% of Americans surveyed say they sometimes buy gluten-free because they believe this. But it is not so. In fact, gluten-free foods are very often less healthful because they contain less protein, fiber, and vitamins and more fat! And of course they are more expensive and usually don’t taste as good. If only. Fact is, there are numerous toxic pesticides (insecticides, herbicides), both natural and synthetic, permitted on organic crops, with the full blessing of the organic certification agency. This includes pyrethrins, nicotine, spinosad, and copper sulfate. And some organic farmers are pressuring the FDA to allow additional pesticides. Don’t get me wrong, many nasty chemicals are indeed banned in organic farming, and that is surely a good thing for the farm workers and the environment. But don’t be deluded into thinking that organic food is pesticide-free. At the heart of sushi is the rice – not raw fish as some people mistakenly believe (see my related post here). In a nutshell, medium-grained rice is cooked and, while hot, mixed with a vinegar/sugar/salt mixture. After cooling, the sushi rice is used to make the sushi. Some unscrupulous companies have perpetuated the myth that you need a special kind of rice to make sushi, and I have seen small bags of “sushi rice” for sale at outrageous prices. Fact is, the rice use for sushi is the same medium grained rice used for many other purposes in Japanese cuisine. You do not need to pay extra for “sushi” rice. Our favorite is Kokuho Rose brand, closely followed by Nishiki. These are California-grown and are every bit as good as the much more expensive Japanese imports. They are widely available, you can even get the Nishiki through Walmart! So, don’t waste your money on overpriced rice! Nitrates and nitrites have been used for centuries as part of the meat curing process (bacon, corned beef, sausages, etc.). They inhibit bacterial growth (particularly the deadly botulism bacterium), improve taste, and give the meat a nice color. But there’s been this “anti-nitrate” movement for a couple of decades now, claiming that nitrates cause cancer and all sorts of nasty stuff. They even pressured Whole Foods into not selling any nitrate-containing meats. The evidence for this health danger? None. A huge number of studies have been done, and while a few suggest a possible problem the large majority have found no negative effects of nitrates on health. But of course the “anti-nitrate” folks always focus on the few studies that support their preconceived ideas and ignore those that don’t. And think about this: many vegetables contain nitrates, as does much drinking water. Fact is, the Centers for Disease Control has estimated that 90% of the nitrates we consume come from these sources and not from cured meat. Eat a few meals with arugula, butter lettuce, celery, or beets and you’ll get more nitrates than from several hundred hot dogs. But I don’t see Whole Foods removing those vegetables from their shelves. For years I have made hard-cooked eggs by putting them in a pan covered with cold water, bringing to the boil, then covering and letting sit off the heat for 20 minutes. The eggs cooked fine but they were sometimes very difficult to peel, particularly as I always use very fresh eggs from the farmers market. The problem was that the thin membrane just under the shall would sometimes stick to the egg white like glue. I recently found out that the problem with this technique is the relatively slow heating of the egg, which encourages that membrane to stick to the white. In contrast, rapid heating lessens the sticking, so putting the eggs into already boiling water is better from the peeling standpoint. But boiling like that can cause cracking because the eggs bounce around, so better yet is to steam the eggs. Bring 1 inch of water to a boil in a saucepan. Put the eggs in a steamer basket and lower into the pan, then cover. Steam for 13 minutes then cool as peel as usual. I think you’ll appreciate the difference! I wince to hear some people, including a lot of people who should know better, use the term “deboning” to refer to removing the bones from a fish, chicken, or whatever. Do you “depeel” a banana, “descale” a fish, or “dehusk” a coconut? No, duh. The correct term is simply “boning” – the “de” prefix is an unneeded and incorrect prefix. This may sound like “grammar nanny” crap, but why speak like an ignoramus if you don’t have to? For most items, such as cakes and muffins, using cold as opposed to room temperature eggs makes no difference in the results other than requiring a slightly longer cooking time. For cakes that use beaten egg whites as a leavening ingredient, however, cold eggs don’t whip up as well and the resulting cake does not rise as well. If only it were so! Salt is an essential ingredient in so many dishes, that’s just the way human taste works—we like salt (but not too much). With too little salt, savory dishes just taste flat and uninteresting. But over-salted – blech! 1 TB plus 2 teaspoons Diamond Crystal kosher salt. So what do you do when following a recipe? Some just specify “salt” while other specify “kosher salt” without saying which brand (and I am sure there are other brands I have not tried). It’s best to play it safe and undersalt—you can always add more but it is deucedly difficult to take it back! For dishes that are difficult or impossible to salt later, such as terrines, sausages, and meatloaf, it’s worth the trouble to cook a TB or so of the mixture to taste for seasoning before completing the process, and then adding salt if needed. We all know that fish must be kept cold at all times before it is cooked or it will deteriorate quickly. Some people think the fridge is the best place for this, but in fact it’s better to keep the fish on ice. Why? Ice melts at 32 degrees, so a pile of crushed ice that is slowly melting is at that temperature. In contrast, a fridge is typically kept at 35 to 40 degrees. This may seem like a minor difference, but with high quality fresh fish – which is always pretty expensive – it can make a difference. The fish must never directly contact the ice, so in a plastic bag and covered with ice is best. The same goes for other seafood such as shrimp and scallops. Nice story, but false. Marco Polo’s journeys to the far east occurred in the late 13th century, while the the earliest known written reference to pasta in Italy – Sicily specifically – dates from the year 1154, over 100 years earlier. There’s no reason to doubt that the Chinese had their own noodles, but the folks in Italy were making and eating noodles long before Marco Polo. Among some folks, it is an article of faith that one should avoid cholesterol in the diet to lessen the risk of heart disease. So, foods such as eggs, liver, shellfish, butter, and cheese were on many people’s restricted or avoid list. That’s too bad, because research over the past decade or so has shown pretty conclusively that there’s no association between dietary cholesterol and heart disease. It is true that the amount and types of cholesterol in your bloodstream are connected with heart disease, but cholesterol metabolism is a very complex matter and blood levels are affected by many factors, but not by dietary cholesterol (except in so-called hyperresponders, a very small percentage of the population). So, you still may want to limit cholesterol-containing foods if only because they tend to be high-calorie, but there’s no reason to shun them over concern with your cholesterol levels. The paleo diet is one of the latest fads to hit the world of dieting. It is supposedly based on eating only foods that our ancestors in Paleolithic times, some 12,000 years ago, supposedly would have eaten. Thus, the diet permits meat, fish, fruit, most vegetables, nuts, and plant-based oils (such as olive and avocado) while excluding dairy, grains, cereals, legumes (beans, peanuts), processed oils, processed sugar, alcohol, and coffee. The idea behind the diet is the claim that our bodies had, by the end of the Paleolithic, evolved to survive on the foods available at the time and are not designed to process foods that were introduced since then. There are many fatal flaws in this whole idea. The most serious flaw is the assumption that evolution “designed” us to be an ideal match for our environment and diet 12,000 years ago. This is completely wrong, as any high school biology student should be able to tell you. Evolution doesn’t “design” anything, all it does is favor the continuation of genes that are associated with leaving more offspring. Thus, a caveman who was sickly and died at 25, but left 12 children, was an evolutionary success and his genes would continue in the population. In contrast, another caveman who lived a healthy life to the age of 60, but left only 1 or 2 children, was not a success in evolutionary terms. In other words, the notion that Paleolithic folks were ideally adapted to their diet is pure nonsense. As long as their diet allowed them to leave children, that was enough. A second serious flaw is the diet’s assumptions about what foods people did and did not eat back then. There is, for example, quite a bit of evidence that Paleolithic humans ate grains and legumes, but these foods are forbidden by the diet. In fact, there is evidence that humans were cooking and eating tubers and other starchy vegetables as much as 300,000 years ago. Paleo humans did not eat peppers, tomatoes, avocados, potatoes, pineapple, or blueberries (among others) because these are new world plants that were not available during Paleolithic evolution. Yet the diet allows them all. Dietary flexibility was a hallmark of humans and one reason for our evolutionary success—we did not evolve to eat certain specific foods, we evolved to eat pretty much anything. Would anyone care to argue that Paleolithic humans in the sub-arctic zones, the rain forest, the plains, and the tropical coastal regions ate the same or even similar diets? I don’t think so. A third flaw is the claim by diet proponents that human genetics have not changed in any meaningful way since Paleolithic times and therefore the human digestive and metabolic systems cannot have adapted to deal with “new” foods. This is flat-out false. It is well documented that human genes have changed in response to the introduction of dairy into the diet and to the development of agriculture, with the greater availability of wheat and other grains. While on the subject of genetics, it’s impossible to understand why humans have multiple copies of the gene for amylase, an enzyme whose sole purpose is digesting starches, if starchy foods had not been an important part of the human diet for a long time. That’s strike three, I believe! As if we needed a strike four, the life expectancy of humans in Paleolithic times was somewhere in the mid-30s. Is theirs the diet you want to eat? Of course, many other factors have contributed to the increase in life expectancy, including improvements in medicine, public health, and nutrition. Oh wait, did I say nutrition? You know, like eating grains, legumes, and dairy? There are good aspects to the paleo diet, namely the avoidance of overly processed foods and of excess carbs and sugar (emphasis on excess). But, there’s nothing “paleo” about these ideas, they are part of many dietary regimes. So if you want yet another trendy fad diet to waste your time and money on, be my guest and go paleo. Gluten is a protein found in wheat and related grains (barley, rye, bulgur, farro, kamut, spelt, triticale, and according to some people, oats). Gluten gives bread dough its elasticity and helps it to rise. Gluten has been getting a bad rap lately, a rap that is undeserved. Unfortunately, it has become trendy to avoid gluten, and all too many people leave their brains in neutral and buy into all the scare-mongering that has grown up around gluten (much of which, needless to say, comes from people trying to sell you gluten-free products). It’s true that about 1% of people have a true gluten allergy (celiac disease), and consuming even small amounts of gluten can cause these people great distress and serious medical problems. For the rest of us, however, there is nothing to worry about. After all, gluten has been part of the human diet for some 10,000 years, and there is not a single shred of legitimate medical evidence linking gluten to autism, Alzheimer’s, or any other health issues. Really, not a shred! Some folks claim to have lost weight with a gluten-free diet. Well duh, if you don’t eat any bread, bagels, cake, or pasta, that will happen! Some folks claim to simply “feel better” without gluten, but that’s a subjective response that may be more the result of eating a lot fewer carbs without being directly related to gluten at all. It’s also the case that when eating gluten-free, it’s very easy to short yourself on the fiber, vitamins, and minerals that are found in gluten-containing grains. So, if you want to be trendy by avoiding gluten, go right ahead, but don’t fool yourself into thinking you are getting any health benefits. GMO (genetically modified organisms) refers to crops, such as soybeans, corn, and cotton, whose genome has been modified in the lab to provide some advantage, such as herbicide resistance, improved nutrition, resistance to insect pests, improved yield, or reduced water needs. When GMO food crops were first introduced in 1996, there was perfectly understandable concern that there might be some health consequences from eating foods made with GMO ingredients. However, since then many studies and a lot of real-world experience has shown these worries to be unfounded. Hundreds of millions of people have eaten an untold number of meals containing GMO ingredients, and there has not been a single documented case of anyone’s health suffering as a result – NOT A SINGLE CASE! As a result of this and other evidence, dozens of scientific organizations have declared GMO food to be as safe as any other food – these organizations include the French Academy of Sciences, the World Health Organization, the European Commission, the Royal Society, and the U.S. National Academy of Sciences. Yet, opposition to GMO foods on health grounds remains widespread. It’s hard to figure out why, other than the all-too-common human propensity to ignore facts and believe what feels good (or what fits in with their conspiracy theories, such as the hare-brained idea that the above-listed scientific societies are in the pay of Monsanto). The opposition is also fueled by charismatic hucksters such as Vandana Shiva who travel around spreading lies and distortions about GMO food and making up “facts” as it suits them. Unfortunately there seems no end of gullible people ready to swallow this nonsense (for example, GMO foods cause autism, Alzheimer’s, suicide of farmers, cancer, allergies, and so on.). There is no evidence for any of these claims. This is not to say that there are no legitimate concerns related to GMO crops, such as industrial farming, monoculture, corporate ownership of seeds, and loss of genetic diversity. There is also growing concern over the heavy use of the herbicide Roundup (a GMO crop that is Roundup-resistant allows the herbicide to be sprayed freely to kill weeds). The ingredients in Roundup have been linked to cancer in a recent World Health Organization report, and the product has been banned in many countries, but not the U.S. These are separate issues, however, unrelated to the (nonexistent) health risks of eating GMO food. Update: While GMO foods seem to present no health dangers, a new report (October 2016) indicates that they are not bringing about the predicted benefits of higher yields and lowered pesticide use. Comparing the US and Canada, where GMO crops are widely used, with western Europe, where they are banned, no yield benefits from GMO crops were seen. Insecticide use in the US/Canada has decreased, but it has decreased even faster in France. And while herbicide use in the US/Canada has shot up, it has decreased in Europe. So, the “great promises” of the GMO revolution have yet to be realized, except perhaps for seed and herbicide manufacturers’ bottom lines. Many folks have paid for a pressure gauge on their propane tanks in the mistaken belief that it tells you how much propane is left. Me too, I got one before I figured out that it is useless. How come? High school physics class to the rescue! In the tank, the propane is mostly liquid. At the top of the tank, above the liquid propane, is gaseous propane. When you open the valve, some of the propane gas is released, and some of the liquid vaporizes to maintain what physicists call the vapor pressure – the pressure at which liquid and gaseous propane are in equilibrium. As long as there is some liquid propane in the tank, this pressure remains the same (although it does vary with temperature, being higher when the temperature is warmer). Whether 95% full or 5% full, the pressure is the same. Only when there is no more liquid propane in the tank will the pressure shown on your gauge drop. You can tell how much propane is left by weighing the tank, but that’s a bother. You can also tell by feeling the side of the tank when it is in use (when your grill is on). At some place the tank will be colder below, warmer above. That’s the level of the liquid propane. Bottom line? Keep an extra tank on hand. Both the terms “stock” and “broth” refer to a flavorful, savory liquid made by simmering ingredients in water for a long time until all of the flavor is extracted, then straining and discarding the solids. Meat is usually part of the recipe, but not always. Some people will insist that the two are different. Stock is made with bones, they say, and broth is not. Broth is for drinking, they claim, and stock is for cooking. It’s true that some cookbook authors make these claims, but they are not consistent–what one famous chef says is stock is another chef’s broth. Let’s face it–who cares? Good stock/broth is essential to many kinds of cooking. Bad stock/broth should be fed to the pigs. I have met more than one person who claims to be a vegetarian, but happily chows down on fish, scallops, and other seafood. Sorry, this just won’t wash. Fish are animals, and by definition a vegetarian does not eat animals. No, Virginia, a clam is not a vegetable! Of course there is nothing wrong with eating seafood, it is tasty and healthy. But, it is not vegetarian. If you eat seafood but no other animals, then you are a piscaterian. I used to do this for years, also with mussels. Turns out it is usually a waste of perfectly good clams. An unopened clam may be bad, but in my experience they are usually fine. What I do is set the unopened ones aside and deal with them separately. In almost all cases they are very easy to open with a blunt knife and the little feller inside is just fine. When you do find a bad one, out it goes. If you find more than a very occasional bad one, you might want to buy your clams elsewhere. As an aside, fresh clams should always be stored in the fridge in a ventilated container, never a sealed plastic bag. They are alive and use some oxygen – not much, but a sealed bag will suffocate them and then you will have a bunch of bad clams! A sharp knife cuts more easily, so this make sense – right? But, it is not true. With a sharp knife, cutting is easily done and nothing needs to be forced. And it’s the forcing that causes cuts, when you have to press down hard and the knife slips onto your finger. Ouch! With a really sharp knife, your cutting can be smooth and relaxed, with less danger of cuts. So, keep your knives sharp! To the contrary! Since being turned on to coffee roasting a while back (after a visit to an organic coffee plantation in Nicaragua), I regret not having started sooner. If you want better, cheaper coffee for little effort, read on. If you like Charbucks – err, I mean Starbucks – coffee, don’t bother. Process: A coffee roaster can cost as little as $130. It looks sort of like a blender and works by blowing hot air up through the beans to agitate and roast them. Add the green (raw) beans, turn on, and forget – it’s that simple. You can vary the type of roast (light, medium, dark) by varying the roasting time and/or temperature. This process will generate some smoke, particularly when making a dark roast, so be forewarned. There are also drum smokers that heat the beans in a rotating drum. Savings: Green coffee beans, easily available over the internet, cost in the $5-7 / pound range with a few exceptions for super-premium beans like Jamaica Blue Mountain. Beans lose 15-20% of their weight in roasting, so a pound of roasted beans ends up costing $7.00-$7.50 / pound. Compare that with the $12-15 that high quality roasted beans cost. Your savings will soon pay for the roaster and you’ll be saving money. Variety: My favorite source of beans, Burman Coffee Traders, currently lists green beans from Costa Rica, Hawaii, India, Brazil, Colombia, Ethiopia, Guatemala, Indonesia, Jamaica, New Guinea, Tanzania … the list goes on. Decaf beans are available as well. Plus, you can experiments with your own blends. So, if you love coffee – good coffee that is – you might want to try roasting your own. In fact, the opposite is true – dissolved salt raises the boiling point of water. For the amounts used in cooking, however, it is a tiny amount, a fraction of a degree, and you needn’t be concerned about it. A soufflé is a delicate creation that rises due to expanding bubbles in beaten egg whites. A sudden shock such as the oven door slamming will, supposedly, cause it to collapse. While this may be a nice plot twist, tests show that it isn’t true – your soufflé will survive a slammed door just fine, as will delicate cakes. I was quite interested to find out that this is not only false, but it is defined by US Government regulations. Whipping cream must contain at least 31% butterfat but no more than 36%, while heavy cream must contain at least 36% butterfat. What does this mean to you, the cook? When making whipped cream, heavy cream takes longer to whip but lasts longer once prepared (losing its peaks and becoming watery). In contrast, whipping cream whips faster but does not last as long. A more important difference may be between creams that are pasteurized vs. those that are ultra-pasteurized. Both treatments kill bacteria and extend the shelf life of the cream, but the ultra procedure uses a much higher temperature. The result is cream that lasts longer (in the unopened container) but does not whip as well or taste as good. Look for local, pasteurized (not ultra-pasteurized) heavy cream that is free of additives. Fresh corn on the cob is, of course, best cooked as soon as possible after picking, but that’s not always possible. How should it be stored? Many people say not to refrigerate it, but that’s a myth. Put it in the fridge – after all, the chemical reaction that causes corn to lose its sweetness is slowed down by cold, just like almost all chemical reactions. Corn can still be wonderful after a day or two in the fridge, although not as good as really fresh. By the way, an easy and energy-efficient way to cook corn is to put the husks and trimmings in the bottom of your kettle, pile the ears on top, and add an inch of water – instant steamer! Cover and boil for 4-10 minutes depending on the corn and your preferences. By not bringing a full pot of water to the boil, you save time and energy. Many people believe than an acidic marinade – one containing wine, vinegar, or citrus juice – will make meat tender. In fact, the opposite is often the case. Acid interacts with the proteins in the meat, causing the protein molecules to pack more closely together and thus squeezing liquid out of the meat. The result? Tough and dry steak, chicken, or what have you. What’s more, extended exposure to acid can cause the surface of the meat to become mushy because the proteins start to break down. The rule, then, would be to keep acidic marinade periods short, but then of course the flavor won’t get into the meat very well. My approach is to rely on non-acidic marinades. The fact is, marinades in general don’t have nearly the effect that many people think because the flavors just cannot penetrate beyond a millimeter or two at the surface. Salt and water in a marinade can penetrate deeper, and the benefit of most marinades is the result this factor. When a recipe calls for fresh basil, you’ll often hear chefs saying to tear it with your fingers, rather than shredding it with a knife, to get the best flavor. Sorry, but nope. The flavors in basil – like any herb – are primarily contained within the cells of the leaf. If you tear it, it tends to come apart between the cells so that less flavor is released (because it stays in the cells). If you cut the leaf, you will break open the cells (some of them, anyway), releasing more flavor. This makes the most difference when you are using the basil raw, as in a tomato salad. In cooked dishes, such as a sauce, it does not make as much of a difference because the cooking gets the flavor out of the cells. My technique is to wash the basil, pat dry with paper towels, and remove the leaves from the stem. Stack several leaves together and roll into a cylinder, then cut crossways into thin strips. The Fair Trade Labeling Organization was started in response to the plight of coffee growers, who often received dismally low prices for their product. If a coffee cooperative met certain labor, environmental, and social standards (among other things), their coffee could carry the Fair Trade label, and they received a higher per-pound price than they would otherwise (still a low price, but definitely an improvement). Fair trade coffee is a small part of the total coffee market, about 1/2 of 1%, but it allows socially conscious consumers to ensure that the growers of their coffee are receiving a fair shake – this is a good thing! Unfortunately, many people have the misconception that any coffee labeled Fair Trade is automatically of the highest quality. This is not the case. It’s an open secret among high-end coffee roasters and drinkers that Fair Trade coffee is often of lower quality. After all, the requirements for earning the Fair Trade label have nothing to do with the quality of a grower’s coffee, but only with meeting the Fair Trade requirements. When the price a grower receives for coffee has little or nothing to do with quality, there is no incentive to work to maintain or improve quality – with predictable results. I am all for the Fair Trade idea, I have traveled in Central America and am aware of how much work goes into growing and harvesting coffee, and these people should definitely be paid fairly. The fact is, however, that if you are fussy about the taste of your coffee, as I am, and seek out only the highest quality beans, the growers of those best quality beans will have received more than the Fair Trade price for their crop. There is a new coffee certification called Direct Trade that was created in response to problems with Fair Trade. It too requires reasonable prices paid to the growers, but also provides incentives for high quality coffee. You don’t hear much about Direct Trade, but you can learn more on Wikipedia. So, if you like the taste of the Fair Trade coffee that you buy, that’s great, but if you really want to help the growers, insist on the highest quality coffee you can find, or buy Direct Trade. Hint: it’s not at Starbucks. This myth is based on the reasonable idea that eggs crack, when being hard- or soft-boiled, because the air in the shell expands from the heat. The pinhole is supposed to release this pressure. Reasonable, yes, but tests show that a pinhole really does not reduce cracking. Rather, cracks occur either because the egg already has an invisible crack in the shell, which expands during cooking, or because the egg is being knocked about in the pan by too-active boiling. This seems to make sense—cooking meat in a moist environment would keep it moist, right? Not necessarily. A major determinant of the final moistness of meat is how hot it got during cooking. So, how you stew or braise the meat is really important. Cook at a boil, where the meat may reach over 200 degrees, and it’s likely to be dry. Cook at a gentle simmer, keeping things at 180 degrees or so, and the results will be much better. There’s a kernel of truth in this one. When you beat egg whites until they are stiff, you are actually creating a foam in which the egg white proteins form bubbles with the air you are beating in. Fats tend to collapse foams and an egg yolk contains a lot of fat, hence the origin of this “rule.” It may have had some validity when people made meringues by hand, but with today’s power mixers you’ll be able to make a perfectly good, stiff meringue even if a bit of yolk gets mixed in. I remember learning this in high school – the so-called tongue map that claimed that each of the 4 fundamental tastes were “picked up” on different parts of the tongue: bitter in the back, sweet in the front, sour on the sides toward the back, and salt on the sides near the front. This was shown to be false long ago–all areas of the tongue are sensitive to all the tastes. And yes, there are now believed to be more than 4 basic tastes. A fifth, savory or umami is widely accepted, and some researhers argue for a sixth, piquance. I used to think so until I read that experienced bartenders like to let the juice sit for 3-4 hours after squeezing for best flavor. A test by Cooks Illustrated verified that letting the freshly squeezed juice sit, covered, in the fridge for 4 hours (but not much longer) gave a “more mellow yet complex flavor.” Doesn’t work with other citrus juices, however. In fact, orange juice is best squeezed just before serving for best flavor because sitting for even a few hours can permit the formation of limonin, a harmless but bitter-tasting compound. Some intensely colored veggies are indeed packed with nutrients, think for example of leafy greens like kale and chard. But, a pale countenance is not necessarily a sign of nutritional poverty. White beans (navy, great northern) have as much fiber and protein as, say, kidney beans. White cabbage has lots of vitamins, calcium, iron, and fiber. White cauliflower is packed with antioxidants. Don’t judge a veggie—or a fruit, for that matter—by its color. Most of us use cubes made with tap water, using either an ice cube tray or a built-in ice maker. They tend to be cloudy and sometimes don’t last as long as we’d like. But, ice is ice, right? Not necessarily. Home-made ice freezes from the outside in. Air that is dissolved in the water, plus any minerals (worse if you have hard water) are pushed to the center, last to freeze, where the create bubbles and haze. The resulting ice cubes contain less actual ice than bubble-free ones of equal size would, and when they melt you may find a sediment of the previously-dissolved minerals at the bottom of your glass. To avoid this, use distilled water (no dissolved minerals) and bring to a boil briefly, then cool and freeze (the boiling drives out most of the dissolved air). You’ll get clear, sediment-free cubes that last a good deal longer. Worth the effort? Maybe only for special occasions! Makes sense, right? Cold preserves food and slows down flavor loss for other foods, why not tomatoes? Turns out they’re unusual. Flavor development in tomatoes depends on enzymatic activity that continues throughout the ripening process, even after picking. Chilling inhibits this process, resulting in less flavor. Chilling – meaning temperatures below about 55 degrees – also can affect the texture in unpleasant ways. Store your ‘maters at room temperature. Of course, many commercial tomatoes are so tasteless to start with that the deleterious effects of refrigeration won’t be noticed! This all-too-common belief seems to make sense. Wouldn’t a company that is preparing products to meet religious restrictions also use more care and attention in the entire process, and meet more stringent standards when it comes to humane animal treatment, cleanliness, and so on? Nice idea, but not true. “Kosher” means nothing more than “kosher,” which means pretty much only that there are no forbidden creatures (for example, your kosher hot dog is just beef, no pork), the animals were slaughtered a certain way, and that meat and dairy products are kept strictly separate (there’s a whole lot more to Jewish dietary laws, but these are the basics). Being kosher does not mean the animals were raised humanely or sustainably, that health safety standards were rigorously followed, that the meat is fresher, or than the workers were treated fairly. All these things may be true of kosher meat, but there’s no guarantee. There are, of course, many kosher meat products that are very high quality, but the same is true of non-kosher products. I recall when my daughter was playing soccer and the parents took turns bringing drinks for the kids. There were some moms who would go ballistic if someone dared offer their kid a soft drink, but would be perfectly happy for them to drink as much apple or grape juice as they wanted. Guess what, most fruit juices are just sweet, flavored water with no more nutritional value than a Coke (a bit of vitamin C is meaningless) and just as much sugar. In fact, drinking fruit juices has been linked in several studies to increased health risks and weight gain. When you eat a piece of fruit, you get everything in the fruit – the sugar, yes, but also the fiber and other constituents that don’t make it into the juice. The fiber has the effect of slowing down the absorption of sugar into your blood stream, a good thing. This also has more of an appetite-satisfying effect, making it less likely you’ll crave a snack soon. This is not to say you should banish fruit juices from your life. But, don’t fool yourself that they are somehow better than other sugary drinks. In fact, you can’t judge an egg by its cover, or some such. The color of an egg’s shell has nothing to do with the quality of what’s inside but rather is related to the color of the hen’s feathers and earlobes.